You know how they ask parents to come to kinder and tell the children about their occupation? Well one of the dads at my kid’s kinder arrived in his pilot’s uniform with some model planes to show off – pretty much blowing the paper-pushing office workers out of the water. Children are naturally curious about what their parents get up to all day at the mysterious place called ‘work’. My kids love accompanying their dad to his office simply because the secretaries are generous with the biscuit jar but I’m not sure they could articulate how he actually fills his day. I have come across two fantastic stories about what goes on at ‘work’ and both make office jobs sound quite fun. The first is What Does Daddy Do? by Rachel Bright. It tells of a little girl, Daisy, whose friends at preschool are comparing notes on their father’s occupations. Naturally the other childrens’ fathers have exciting and glamorous jobs (fire fighter, doctor and so on), which leaves Daisy wondering what her dad does. Extrapolating from what she knows about her dad – for example he has “mountains of paperwork” and a boss that “is a dragon”, Daisy decides that her dad is an explorer, a knight and a superhero – “…he has to rescue people from a big bored room and he always has to fly…” Needless to say the other children are in awe. It’s a funny book with big, fanciful illustrations and is available from Fishpond for $10.95. 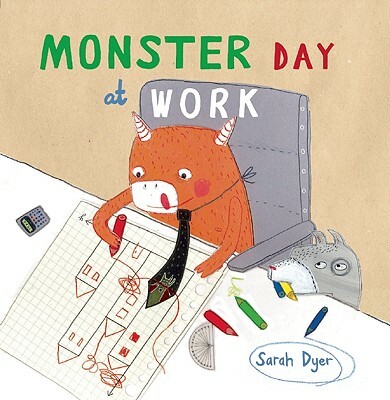 Next up is Monster Day at Work by Sarah Dyer. Like What Does Daddy Do?, Monster takes all the elements of an average office day and examines them through the eyes of a child, in this case a quirky little monster. To this monster, daddy’s working day is an utter breeze – drawing, lunch and a snooze all take place while his dad is labouring over spreadsheets, stuck in meetings and battling rush hour. Parents will enjoy the sly humour and kids will enjoy the oddball characters and crazy stylised illustrations. Monster Day at Work is available from Fishpond for $23.49.